Levels of participation in the organic category vary widely. The Hartman Group’s World Model helps explain the variance in consumer orientations towards organic products. Welcome to the new world of organic. The organic market has flourished much as we predicted back in 1997, when we foretold a fast-changing corporate gameboard within a vibrant subset of consumer packaged goods (where large companies would begin to dominate a fragmented market through acquisition of small, pioneering brands) but also accurately foresaw that the explosively growing organic category was capable of steady, sustained growth in the years to come. One of the great truths of consumer behavior is that it is social behavior. Instead of treating consumers as largely autonomous decision makers, we suggest looking at the social forces that share in or give order to their decisions. In other words, view the “why” of choosing particular goods and services in the context of the activities in which they are used. Common sense would advise us to consider how people use products and services and to recognize that the level of interest from consumer to consumer reflects basic lifestyle differences. We use lifestyle as a device to characterize an entire world of activity. The world perspective takes into consideration all of the individuals, organizations and cultural practices that contribute to or shape a given category or activity. The best way to understand how a world works is to picture it as a globe. Within a given world of activity (e.g., the world of organic), we can envision a center, the “Core,” as well as an outer edge, the “Periphery.” The individuals in the Core, even though they may not be large in number, are the most creatively active in a particular world of activity, while those at the periphery are those maintaining only minimal, infrequent and less intense involvement in that world. 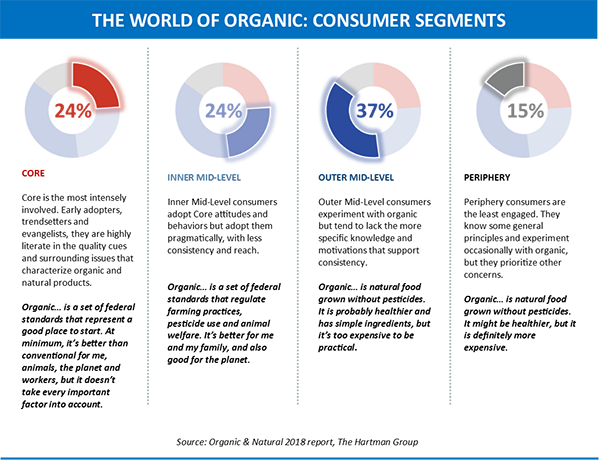 The Hartman Group’s World Model helps explain the variance in consumer orientations towards organic products. For the world of organic food and beverage, the intensity and meaning of “organic” varies depending upon which consumer segment is participating. 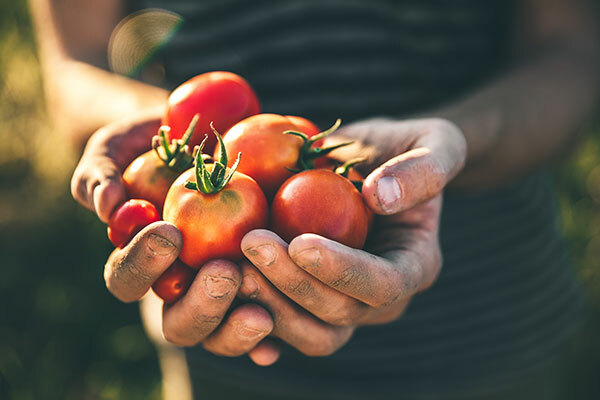 For example, Core consumers who have adopted organic foods have done so with the expectations that the food has been grown and cared for with intent to take care of the land and the recipient’s health. For the Periphery, organic may simply mean something “new” with only vague health benefits. 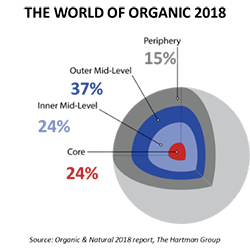 The figure to the right from our Organic & Natural 2018 report depicts the segments within the world of organic. We find that many consumers have recently shown increasing aspirations to purchasing organic products, and we have witnessed the mainstream adoption of a wider range of Core behaviors. The closer a consumer is to the Core, the better they are able to articulate the reasons behind their organic purchases. Segmentation is based on organic usage, number of organic categories purchased, importance of organic when shopping and associations with organic. Of the U.S. consumers who use organic products, the majority (61 percent) is made up of Mid-level (Inner + Outer) organic consumers, with smaller segments at the two extremes: 24 percent are Core consumers, and 15 percent are Periphery consumers. The Outer Mid-level is the largest consumer segment (37 percent). The Core is the most intensely involved. As the trendsetters and early adopters, they are the most knowledgeable regarding issues surrounding organic products. By understanding the Core, we are able to examine potential upcoming important issues, which Mid-level consumers may come to espouse over time. The Mid-levels represent the majority of consumers and thus the biggest opportunity. Inner Mid-level consumers aspire to Core attitudes and behaviors but pragmatically apply them with less consistency and reach.